Understanding Social Security is not easy. In fact I suspect there is no individual who can fully explain all the intricacies of funding, benefit calculations, or claiming strategies. In simple terms the benefit formula provides a higher percent of income on lower earnings and less as income increases. In terms of income replacement, the formula rightly favors the lower-income individual. If your average monthly earnings are $3,000 you will receive a higher income replacement from Social Security than a person with average monthly wage increase earnings of say $5,000. You can see the current calculation below. In 2016 a person will receive $1776.00 or 44% replacement on $4,000 average monthly income. However, keep in mind the average income probably is not the final income before retirement thus the actual replacement is lower in terms of current living standard. Nevertheless, living in retirement with 44% or less income replacement will not cut it for most people. Experts say 70% to 80% replacement is necessary, I say even more. It would appear that the closer your income is to the taxable wage cap, the more you are subsidizing lower-income workers who receive a greater return on their money. Someday the politicians will tell us what they mean by expand Social Security. Perhaps they mean extend part (a) of the formula so a greater portion of income uses a 90% factor. Or maybe they will say Social Security should replace 50% 60% or 70% of income. Yikes 🤑 will there be any take home pay left? For all those who claim the way to go is simply tax more wages, keep in mind with Social Security playing less of a role in retirement income, the “wealthy” (actually the worst upper middle class) have a greater responsibility to fund their own retirement. And talk about responsibility, many of the people complaining about inadequate Social Security benefits made choices over their working lives that led them to reliance on SS. Living above ones means, failing to save, failing to carry adequate insurance especially life insurance for a surviving spouse and in a few cases declining survivor benefits under a pension plan are all part of the American live for today way of life. Forgot to note that if we create a minimum benefit equal to the federal poverty level for an individual who paid in the minimum over 35 years that we would be talking about an income replacement rate IN EXCESS OF 200% OF WAGES. If she/he could live on just over $5,000, chances are, in retirement, she/he could live on almost $12,000. You note: Someday the politicians will tell us what they mean by expand Social Security. My response: So long as a decision to “expand” benefits for an individual is not directly and specifically linked to the wages received and taxes paid by that individual, “expand” will always be defined as “more”. People want the best benefits YOUR money will buy. As a legal mandate, you and I have no option but to accept the “social” aspect of “Social Security”. It becomes a question of what is the “social” – what is the compact, what are you to receive for participating in this program, to what extent is it based (and limited) based on your own contributions, to what extent does it vary (directly or inversely) with your own contributions, and, finally, to what extent should your benefits bear no relationship to your own contributions (minimums and maximums). The answers are arbitrary – the whole scheme is arbitrary. 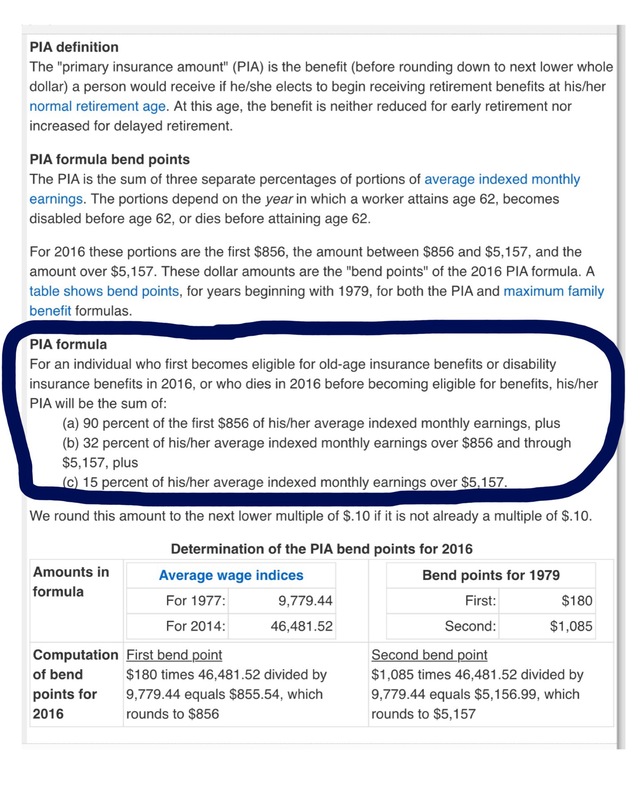 Tell me, why are the percentages 90%, 32% and 15%, why are the bend points at $856 and $5,157, why is the special minimum PIA at 30 years (120 quarters of coverage) approximately $830, and why is the maximum PIA at Social Security Normal Retirement Age $2,639 (instead of $2,640 or $2,638)? For that matter, why is Social Security Normal Retirement Age for someone born in 1955 age 66 and 2 months? Why not age 66 and 34.25 days? Many politicians want to raise benefits, to justify an increase, by arguing that those with consistently low earnings deserve more than the high percentage of pay replacement they already receive. OK. I could accept the suggestion that someone who worked all their life (at least 35 years, or at least 140 “Quarters of Coverage”) and paid in all their life and retired at normal retirement age should have a minimum benefit that keeps them out of poverty. A “Quarter of Coverage” in 2016 is equal to wages of $1,260, or spread evenly throughout the year, that would be a minimum of $5,040 of wages per year, for 35 years, where the tax paid by the individual would total $10,936 (at 2016 rates of 6.2% for OASDI) to qualify for a minimum income replacement benefit of no less than $990 per month, $11,880 per year (2016 federal poverty level in 2016 for the 48 contiguous states). OK by me if we reset the formula to achieve this result – where we would add a new bend point at $420 ($1,260/3) and where the 90% replacement rate would become ~230% (2.3* 420 = $990). However, I don’t agree that we should provide that same level of SOCIAL SECURITY benefits for those who have just barely qualified for benefits – those who only contributed to the system for 10 years (40 quarters), and only contributed the minimum, $3,125 ($5,040 @ 6.2% * 10). To me, that is just welfare. So, my recommendation would be to leave Social Security unchanged – and take action to properly fund it. And, my recommendation would be to reexamine what we do for old age who live in poverty – separate from Social Security. Instead, to create a minimum benefit for old age, recognizing that the individual’s wages and contributions did not fund it, that the minimum bears NO relationship to what was contributed, I would create a separate program (or extend another already existing program) to create a combined minimum income in old age. We have a “safety net” at earlier ages consisting of welfare and other programs. Ask Congress to make a call on what “safety net” should be provided in old age. What “dual eligibility” should be used for Medicaid? What “dual eligibility” should apply for SNAP (there are already exceptions for single adults over age 50 with deminimis accumulated assets to qualify)? And, force Congress to decide whether there should be a monthly minimum benefit when Social Security and SNAP are combined, and, should be no less than the federal poverty level?